Polyclonal antibody raised in rabbit against SMAD3 (SMAD Family Member 3) using a KLH conjugated synthetic peptide from the C-terminal par of the protein. Lysates from different cells treated with TGFb (+) or untreated control cells (-) were analysed by Western blot using the Diagenode antibody against SMAD3 (Cat. No. C15410328) diluted 1:500. The position of SMAD3 is indicated on the right. The antibody recognizes both the phopsphorylated and the unphosphorykated SMAD3. Formalin fixed paraffin embedded cancerous human liver tissue was stained with the Diagenode antibody against SMAD3 (Cat. No. C15410328) diluted 1:400, followed by a peroxidise labelled anti-rabbit antibody. 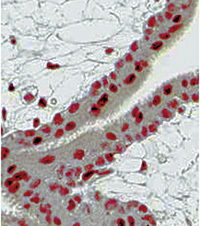 The presence of the SMAD3 protein is shown by the grey color; red indictaed the nuclei. SMAD3 (UniProt/Swiss-Prot entry P84022) belongs to the SMAD (‘mothers against decapentaplegic) family of proteins which are signal transducers and transcriptional modulators involved in multiple pathways. SMAD3 is activated by TGF-beta (transforming growth factor) and activin type 1 receptor kinases which phosphorylates the C-terminal serines 423 and 425. SMAD3 binds the TRE element in the promoter region of many genes that are regulated by TGF-beta and is involved in chondrogenesis, osteogenesis and wound healing. It is also thought to play a role in carcinogenesis. Diagenode strongly recommends using this:	SMAD3 polyclonal antibody - Classic (Diagenode Cat# C15410328 Lot# 001). Click here to copy to clipboard.